Interact or Die! is a collection of essays published to accompany the Dutch Electronic Art Festival 2007, held in Rotterdam from 10 to 20 April. At first sight, the book looks like a conventional catalogue, with interactive works of art shown during the festival neutrally described in various sections throughout the book, including good and intriguing work by, among others, Workspace Unlimited, Exonemo and Herwig Weiser. The hilarious and inimitable project Amazon Noir: The Big Book Crime by Alessandro Ludovico and Paolo Circio of Übermorgen shows that interactive art is going through a fertile and multifaceted period. But anyone looking for a general theory about interactive art will be disappointed. Hurtling along with the texts and images is a stream of ideas dealing loosely with the theme of interactivity in an attempt to evoke associations with the works of art. 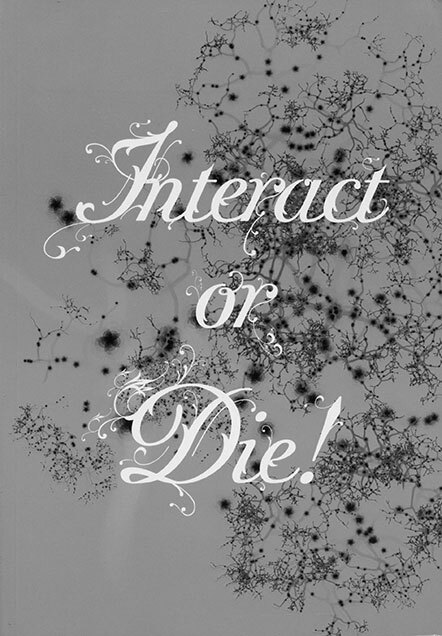 Joke Brouwer and Arjen Mulder write in their foreword that “interaction is a defining characteristic of every living being” and go on to state that “Interact or Die! is about the way in which random behaviour in networks creates strong but flexible structures and forms, without there being a central designing coordinator or code that pushes the process into a definitive direction or form. It explores how interaction both forms and selects the effective, functioning parts of networks and leaves the noneffective parts to die.” This description is abstract enough to apply to a multitude of areas. In The Exercise of Interactive Art Mulder provides a survey and a vigorous analysis of interactive art, using examples by Lygia Clark and Felix Gonzalez-Torres to define an art that changes through the agency of the spectator. As an object, the artwork itself is nothing and can even be destroyed in the process of interaction or acquisition of meaning. According to Mulder, interactive art has a number of implications for the relationships between artist and consumer and between gallery and public space, as well as for the experience of the spectator who realizes that ‘self’ is a product of interaction with other persons and objects. It reflects a continuous process of change whose effect extends to the global level. Mulder’s argument that interactive art is the art of the moment (as both a process of realization and of ‘where it is happening in art’, it is the art of the age of globalization) is subtly contradicted, however, by Brian Massumi. In his view, interactivity has a tyrannical side, and its relationship with power is not neutral. The most effective and ‘loving’ power mechanisms are often capable of binding subjects by giving them the opportunity to express themselves. With this warning at the back of one’s mind, he says, it is necessary to evaluate interactivity critically: which experiences produce interactivity, which forms of life are able to develop such experiences, and what sort of power regimes are thus created? Massumi makes a distinction between art that focuses on an explicit political content and art that seeks dynamic forms and leads to an open process of discovery. The rest of Interact or Die! deals much less, if at all, with interactive art, although this hardly detracts from its readability. Essays emanating from the fields of biology and architecture in particular show that these disciplines are thriving. Sean B. Carroll begins by explaining how interactivity works in evo devo (evolutionary development biology), a new branch of biology that examines the area between development (how an individual creature is constructed) and evolution (how the diversity of creatures changes). The interview with Carroll contains information that most lay persons will find quite technical and detailed, but he also offers intriguing insights into the common toolbox of genes, for example, that determines the physique of most animals. One of the stronger aspects of the book is the juxtaposition of two very different ideas on biology. Just when you’ve been convinced by Carroll, Eva Jablonka adds her comments about four-dimensional evolution and epigenetic inheritance. She is a pliant thinker, which may help explain why, under the influence of molecular biology’s lack of dogmatism, the field is so on the go at the moment. The discussion ultimately leads to interesting speculations on the evolution of the capacity for language, whereby culture acquires a more dynamic place in biology. Enough interesting paths for further thought, but after reading Interact or Die! one is left with a latent feeling of discomfort about the state of thinking, the status of the intellectual. Ultimately, this sort of rhizomatous book is disorientating, mainly because the reader is unable to shake the impression that the majority of contributions are hardly more than personal obsessions. At the same time, of course, no exceptional new ideas, such as those of Jablonka, are created without obsession. Some disciplines, however, are better at channelling these than others. Philosophy in particular feels deficient at the moment and finds it hard to escape a certain stasis, a lack of future-directed ideas. Thus we can see it as an omen that people are turning for inspiration to forgotten thinkers, the last gold lodes preceding the postmodern rupture, as exemplified by Gilbert Simondon, whose contribution concludes the book. Omar Muñoz Cremers is a cultural sociologist and writer. His essays have previously been published in Mediamatic, De Gids, Multitudes and Metropolis M. His first novel is entitled Droomstof (2007). He lives and works in Amsterdam.